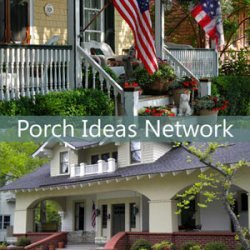 Want Even More Curb Appeal? 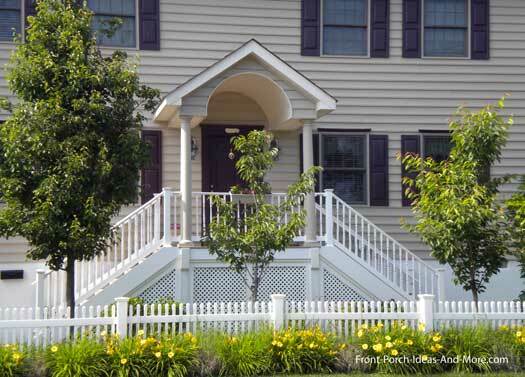 We know modern picket fence designs will help you achieve the look you want for your home. 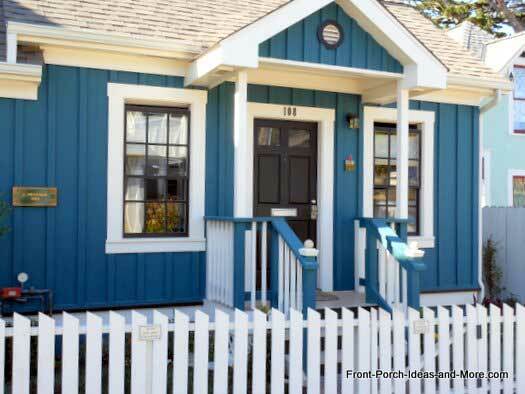 Our picket fence pictures and ideas will help you choose the perfect combination of fence material, location, and look you want for your yard. 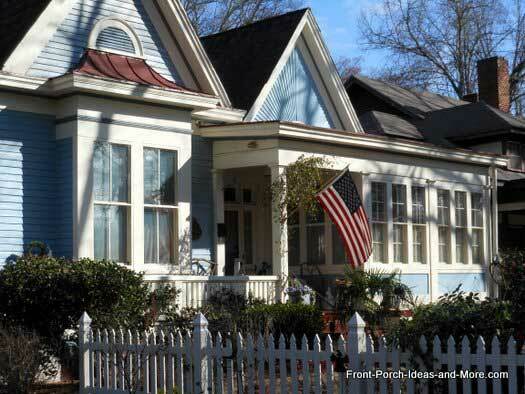 Integrate your picket fence with your front porch, walk ways, and home. 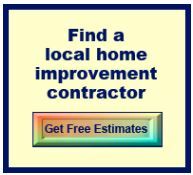 Bet you will want to install a fence right away. 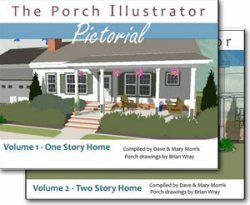 For Mary and I, nothing is more welcoming than a picket fence, beautiful landscaping and a front porch. Picket fences are Americana at its best as evidenced in "The Adventures of Tom Sawyer" by Mark Twain. Remember how Tom got his friends to whitewash the picket fence for him? 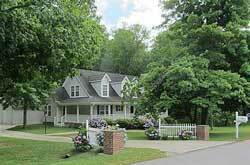 Picket fences are so popular a widely watched TV show, aptly named "Picket Fences" starring Tom Skeritt and Kathy Baker, was a hit a number of years ago. 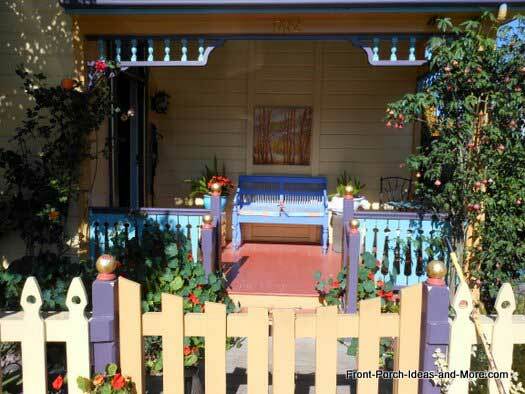 Advertisers also often use tree-lined streets, picket fences, and front porches to promote their products. Pickets are so named because the individual vertical boards resemble pointed stakes that were often used in pre-modern warfare to repel Calvary units. 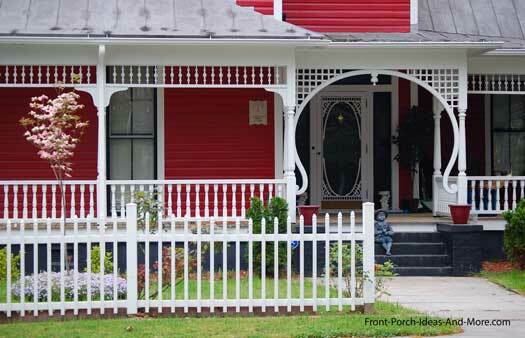 We hope you don't need a picket fence for that reason. 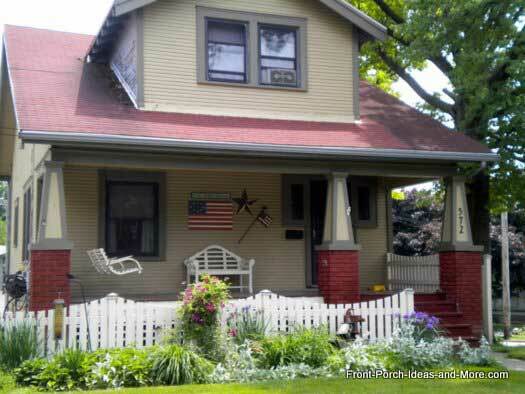 "Wish I lived where I had a white picket fence"
"The movie "It's a Wonderful Life"
"Aunt Bea, Andy and Opie..."
"Picket fences are just so welcoming...as if to say 'Come on in'"
A picket fence definitely adds lots of charm. 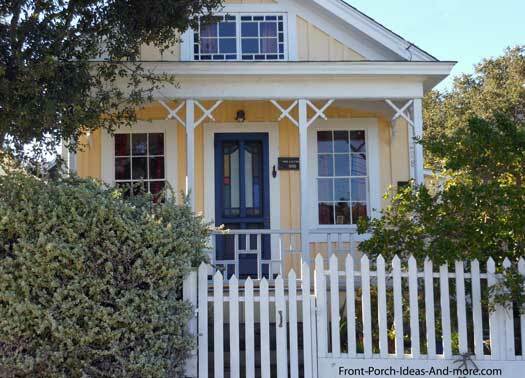 Picket fence designs are typically fairly simple; however, that doesn't mean they do not have lots of appeal. 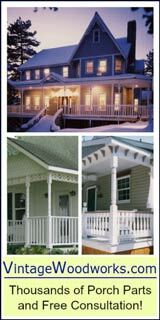 The following picket fence pictures illustrate some common picket designs. You are not limited by these picket fence designs. 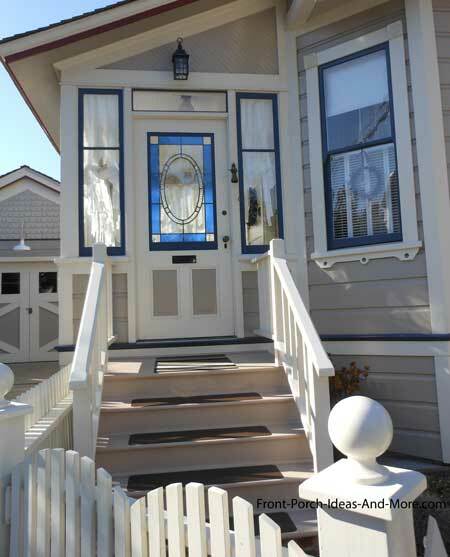 You can also find Victorian, round, square, and other picket fence designs. You can make your own or have them made to a design of your choosing. 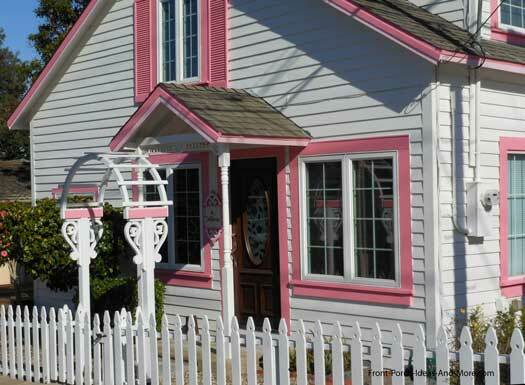 You have other options as well when it comes to picket fence designs. 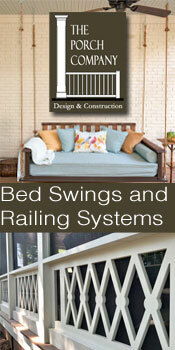 You can mix and match as shown in the photos above or install the pickets to form patterns, too. You need not encompass your entire yard either. 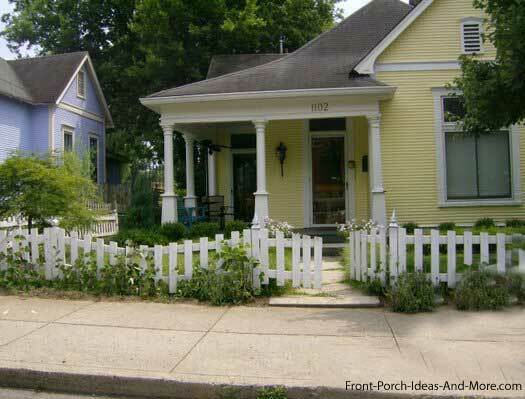 You can use picket fencing at the corner of your property to delineate boundaries or just for the appeal. It is perfect for enclosing gardens too; just add a gate and perhaps an arbor entrance as well. Width: Pickets usually are between 2-4 inches and can be as wide as 5 inches. Thinner pickets tend to have a more delicate look while wider boards appear more substantial and are often used when a bit more privacy is warranted or to contain landscaping in some cases. Style: As you can see from our photos, pickets come in a variety of styles. From Victorian, Gothic, Saw toothed, Dog-eared, to a design of your choosing, you are only limited by your imagination (for wood pickets, that is). You will probably be more limited if purchasing vinyl or metal pickets which usually come in standard sizes. Spacing: The general rule of thumb for thinner pickets is that the space between them is equal to the width of a board (picket). You will want to decrease the spacing if containing pets or safeguarding children. Opt for wider spacing for flower gardens. Since there is no hard and fast rule we recommend you try various spacing configurations to determine which one you like most. 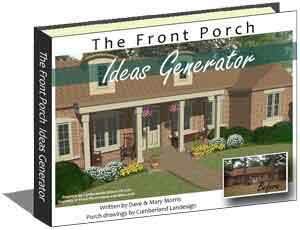 Height:You can also vary the height of your picket fence. Normally, they stand 3 to 4 feet in height but depending on your specific requirements, you may install your fence higher or lower (or a combination of both). You can achieve this by varying the height of the pickets themselves. By doing so you can create concave, round, scalloped, or fences with an ornamental look. 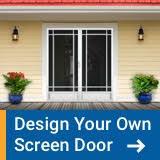 For example, you may want to use a low picket fence for edging around a garden or build it higher for more privacy. 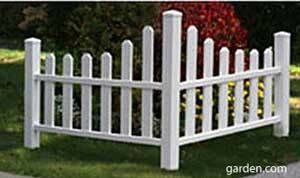 Decorative Fence Options: Your fence posts can be adorned with decorative caps which vary in design. They can be simple wooden caps, copper, or even solar lighted. Cedar: The most common and insect resistant picket fence material is perhaps cedar. 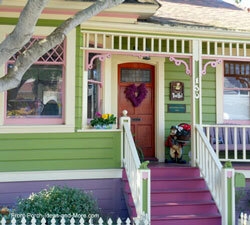 Its natural appearance takes paint well or can be stained easily. Whether staining or leaving it natural, I personally recommend preserving it with Sikkens stain. It comes in a wide variety of colors to include clear. It is more expensive than other wood preservatives but in my experience it has been well worth it. Disadvantage of Cedar: The disadvantage of cedar is that, like any wood, it requires regular maintenance and will decay over time. It will need to be replaced periodically. That being said however, is that you can find a multitude of design options. You can even create your own. Treated lumber: Treated lumber can be used for fencing. It will last longer than cedar; however, it does not take stain well. If you are contemplating stain, I recommend you try it first on your scrap lumber as the end color usually does not match the original stain. Depending on your specific circumstances, I recommend painting treated lumber rather than staining. You can use treated lumber for the posts and rails and add cedar pickets to make it more economical. 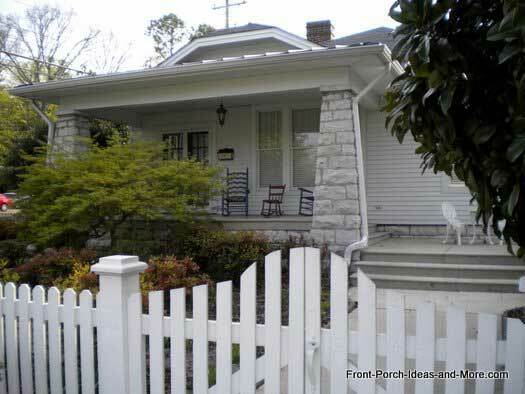 Vinyl Picket Fencing: A white vinyl picket fence is probably the most popular. Vinyl fencing is almost maintenance free and requires little care. The disadvantage of vinyl is you have limited options for both color and style. Dark colored vinyl tends to fade over time and thus is difficult to find (nor recommended). You can find vinyl in white, tan, and almond along with variations for each color. Interestingly, certain colors are more popular in specific areas of the country. White is the choice for those living in the northwest, south, and the middle of the country. Almond colors can be found predominately on the west coast while southwest folks seem to prefer beige and almond colors. Aluminum Picket Fence: Aluminum fencing won't rust and is extremely durable. Finishes are baked on to keep them looking great for years. You can also find them in many different colors like black, white, beige, khaki, bronze, and forest green to name but a few. Most come in standard lengths of 6 feet and heights of 48, 54, 60, or 72 inches; however, you can order custom heights as well. 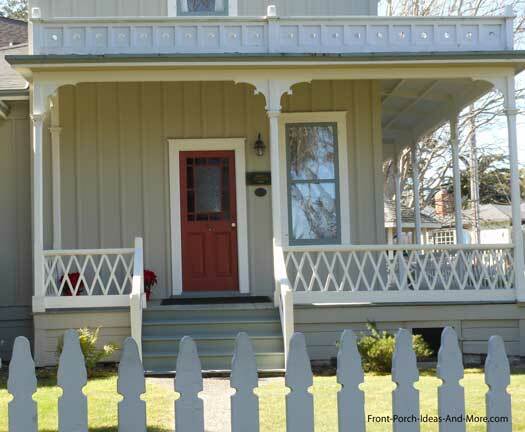 Ready to build your picket fence? 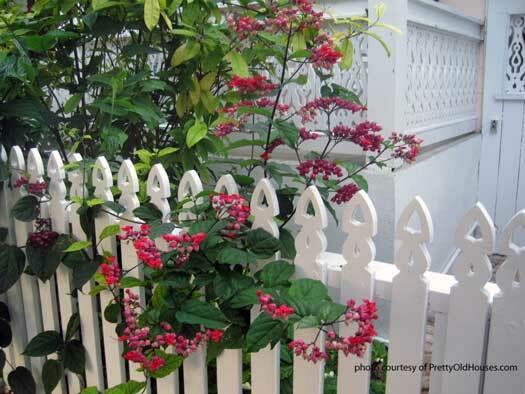 Be sure to see our fence contractors and Four must-know picket fence planning factors too. 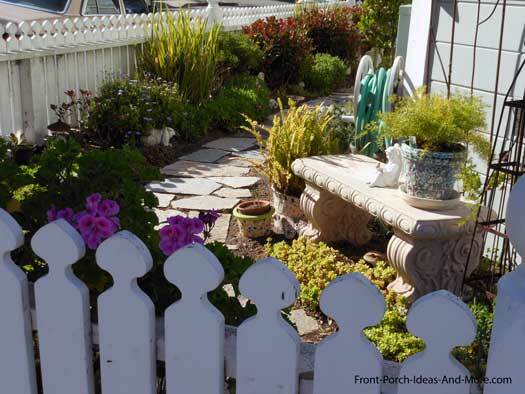 Be sure to see our Picket Fence Ideas Section for more fence ideas.